The NY Times food section seems to be on a bit of a beet kick lately. First there was a series of articles extolling the many, many health benefits of these sugary gems. Then they started showcasing a few recipes promising to instruct loyal Times readers in "new ways" to cook them. New ways?! Pshaw! There's nothing new or exciting about "roasted beets" or "borscht." Even "Mediterranean Beet Salad" has failed to pique my interest. Maybe it's just me, but I expected a bit more from the people who taught us how to make no-knead bread and the "world's best chocolate chip cookies." Sorry, but beet salad just isn't going to cut it. Having recently come into a wealth of beets thanks to our in-office farmer's market, I decided it was the perfect time to try out a few experiments of my own. I usually keep a few roasted and peeled beets in the fridge as they are perfect for slicing into salads paired with tangy goat cheese, peppery arugula, and drizzles of hazelnut oil. But this time I wanted something a little out of the ordinary. The pile of gorgeous beets (torpedo beets! giant candy cane striped chioga beets! baby beets!) was growing bigger and bigger and was just begging me to do something lovely with it. And so, upon discovering a wonderful log of creamy local chevre on sale at Fairway (it's like no other store!) I decided to give beet gnocchi a shot. 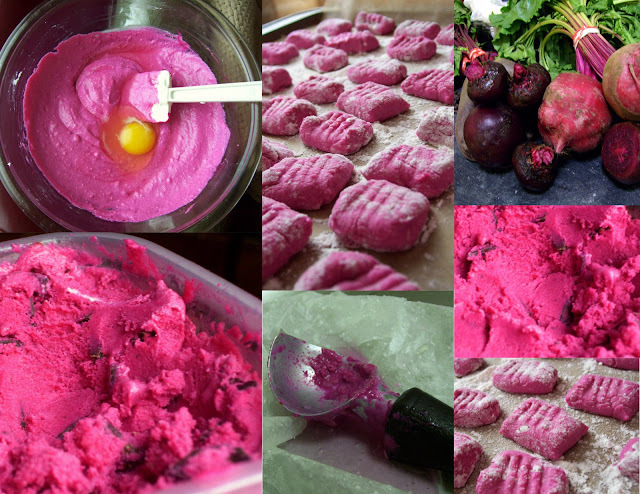 And I figured that while I was at it, I might also try a sweet beet ice cream. When I IM'd my Ukrainian-born (and therefore rather beet-acquainted) boyfriend my plans, he seemed a bit skeptic. "I just can't wrap my head around it," he said, referring to the ice cream plans and instead suggested I try a Russian salad that paired the beets with mayo and garlic. "boiled grated beets+mayo+garlic=$" he messaged. As a mayo-fanatic I didn't doubt that this combination was, in fact, "money," but I was in the mood to be weird with my beets and couldn't be dissuaded. "Just wait until Friday," I insisted. My plans for both the gnocchi and the ice cream were similar. I wanted to cut the natural sweetness of the beets with something cool and tangy. Goat cheese and sour cream are perfect and traditional accompaniments for beets and both lend themselves well to gnocchi and ice cream-making. Not wanting to stop there, I paired the finished ice cream with a tangy and sweet goat cheese panna cotta flecked with vanilla beans; a kind of dessert riff on my favorite salad. The final combination was wonderful. It's by no means a traditional dessert, but if you're in the mood for something a little offbeat and unexpected, I absolutely urge you to give it a try. Oh and if you're wondering, my boyfriend said he couldn't really taste the beet flavor in the gnocchi, although he did enjoy them. And he didn't hate the ice cream! In fact, he completely finished off his portion and my own. He liked the combination of the goat cheese panna cotta with the beet ice cream, although he noted that he didn't think the ice cream could stand alone. 1.) In a large bowl, combine the goat cheese and ricotta until smooth. Add the beat puree and mix until evenly combined. 2.) Add the eggs, one at a time, followed by the nutmeg, salt, and pepper. 3.) Slowly add the flour, 1/2 cup at a time until it is all incorporated into the dough. If your dough seems a bit too wet, feel free to add an extra 1/4 cup of flour. 4.) Turn the dough out onto a heavily floured work surface and knead for a few minutes. The dough will still be fairly wet, but you should be able to handle it. 5.) Working with about a handful of dough at a time, roll out a long snake about an inch thick. Use a floured knife to cut out the gnocchi every inch and a half or so. Roll each gnocchi along the tines of a fork (or simply indent by gently pressing the back of the fork into the side of each nugget). 6.) Place the formed gnocchi on a floured baking sheet. 7.) When ready to cook, bring a large pot of salted water to a rolling boil and add the gnocchi in batches. Let cook until they bob to the surface and then cook for an additional 2 minutes. Use a slotted spoon to pull out of the pot and serve with your favorite sauce. TIP: For extra crisp, finish in a skillet with a bit of butter and torn sage. Let toast on one side (the contrast make for an interesting texture) then serve with a sprinkle of nutmeg and additional torn fresh sage. 1. In a large bowl, combine the beet puree, blood orange juice, sour cream, heavy cream, and sugar and mix until completely blended and smooth (use a fork to break down any lumps). 2. Add the sugar and continue to mix until thoroughly combined. 3. Press the mixture through a fine mesh sieve and refrigerate to chill for at least one hour. 4. Freeze and churn in your ice cream maker according to the manufacturer’s directions. Five minutes before the end of the churning process, add the chocolate chips. 5. Pour into a freezer safe container and freeze for at least 4 hours or until it reaches the proper ice cream texture. Those are quite the purple dishes! It's my favorite color so I completely approve. 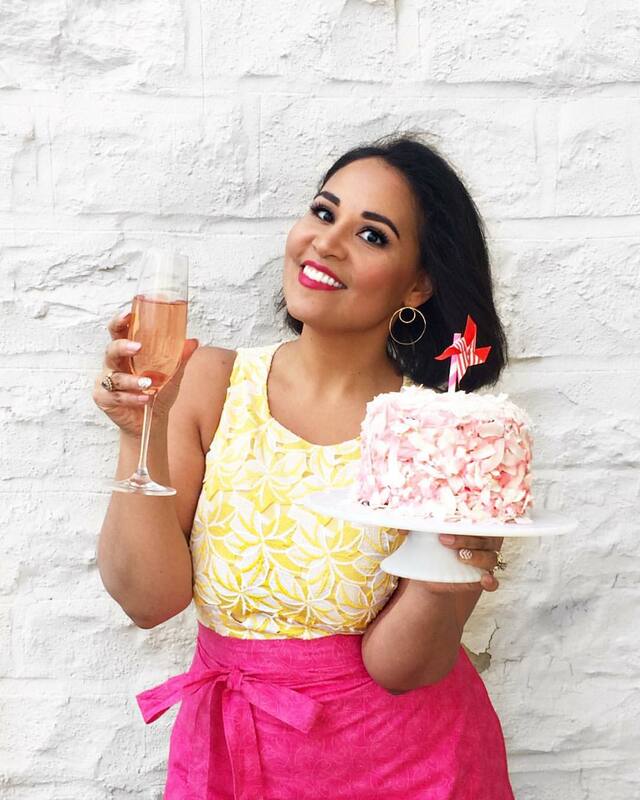 Wow, what a fun day of cooking and baking! Love the colors of everything! I might have to try those recipes simply for the colors - beautiful! Sooo gorgeous! My hands were pink for days! I'm going to try the ice cream. I'm skeptical but I have a feeling I'll end up liking it. I always try to use a lot of color in my kid recipes, these gnocchi are perfect! Thanks for the great idea. Since my local farm has beets on sale, I've been in a beet mood these past few weeks. This gnocchi seems to be calling my name, although I'm not sure if anybody here would eat the ice cream. I would though. I use beetroot juice to colour things pink as my son can't eat berries. We often have a pink banana smoothie or ice-cream. I just wanted to ask though, did the gnocchi stay pink? I've tried making pink bread with beets and although the batter is a fantastic shade of pink, it always comes out of the oven rust coloured or orange. Maybe it's because I used beet pulp left over from juicing? I'd love to know the secret to keeping the colour anyway! Erin: I know I love the colors! I kept staring at the batter and saying "this is so pretty!" My Sweet: It was so much fun! Everything was pink in my kitchen but it was worth it. Wanderluck: The colors are the best part, i think! Jude: Give it a shot and let me know what you think! Sarah: Totally know what you mean! It's festive food! Jen: With a name like yours, you're practically required to give it a shot. I'll have to try that beet ravioli. Sounds yummy! Jennifer: I think kids would love this! I was thinking about maybe trying the puree out in pancake batter for fun pink pancakes! Naomi: Unfortunately the gnocchi loses the bright color when it's cooked, but it does still retain a dull pink. Almost like a mauve color. The ice cream stays bright and gorgeous, but I'll look into ways of keeping the pink, pink and will report back! 10/10 for originality ! never seen either of these 2 before. Very creative and i am intrigues by the beet ice cream. Would love to taste that. I love your cooking and your writing. I made this and absolutely loved it! I mixed it with a sweet potato gnocchi recipe. It's soooo delicious in a sage brown butter sauce.